Renowned for its versatility, reliability and value, the V-Strom 650 has attracted many riders who use it for touring, commuting, or a fun ride when the spirit moves them. It is a touchstone motorcycle balanced with a natural riding position, comfortable seat and a flexible engine character that produces stress-free riding during brief daily use or a high-mile adventure. The 2018 V-Strom 650 ABS shares the profile of the V-Strom 1000 ABS, unifying the V-Strom family. 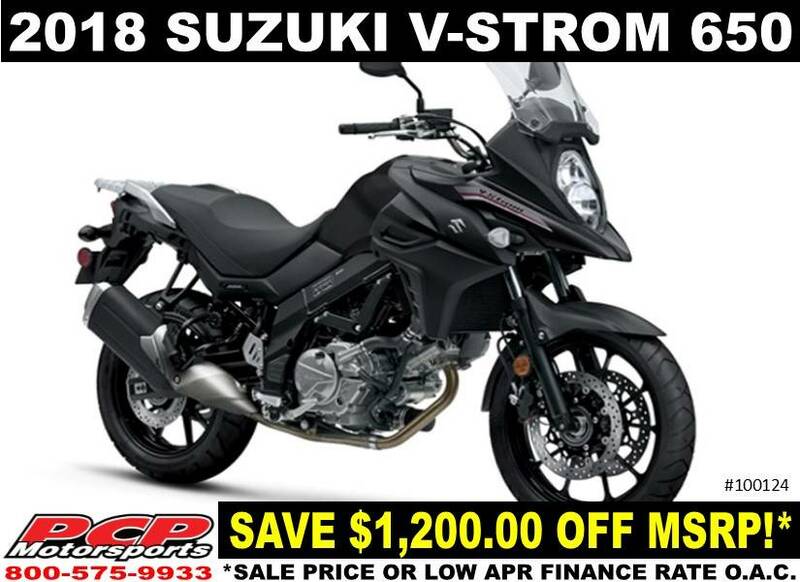 This V-Strom has stellar engine performance and great fuel economy while achieving world-wide emission standards. A number of engineering accomplishments result in low weight and a thin chassis, producing a V-Strom that is more versatile, more controllable, and more accessible to elevate its total performance so it’s simply “More V-Strom”. And that’s what a rider wants; more of a good ride. The beak-style fairing, with vertically stacked headlights and new mounting structure helps the V-Strom 650 cut through the wind, protecting the rider in style. The 3-way height-adjustable windscreen was wind-tunnel tested to reduce wind sounds, buffeting and rider fatigue. The new fuel tank maintains its 5.3 gal. capacity, but is shaped to be thin at the rear to flow into the slimmer seat which aids the rider in touching the ground at stops. The spacious two-up seat combines smooth and slip-resistant surfaces, plus an embossed V-Strom logo. Lightweight, rigid twin-spar aluminum frame and swingarm contribute to smooth handling performance and excellent stability. Spring-preload-adjustable 43mm front forks and link-type rear suspension with rebound damping adjustment and hand-operated spring preload adjuster. Light ten-spoke cast wheels are shod with Adventure-spec Bridgestone BATTLAX 19-in. front and 17-in. rear tubeless radial tires for good all-around performance. Front dual 310 mm-disc brakes and a rear 260 mm-disc brake deliver controlled stopping power. The lightweight resin luggage rack incorporates easy-to-grasp grab bars and aligns with the passenger section of the seat offering a larger surface for carrying cargo or luggage. Even with the new features and engineering, the 2018 V-Strom 650's weight was reduced 2.2 lb. as compared to the prior generation V-Strom 650. The multi-function instrument panel is similar in appearance to the V-Strom 1000 panel, but has functions unique to the V-Strom 650. The instrument set includes an analog tachometer and brightness-adjustable LCD speedometer and control panel. LCD readouts include odometer, dual trip meter, traction control modes, gear position, coolant and ambient temperature, fuel consumption, fuel gauge and clock. Switching between readings can be done with the left handlebar switch. LED indicators include an ABS alert and a freeze warning icon, which, together with the air temperature display, warns of possible icy road conditions. Strong three-phase charging system supplies the 10Ah maintenance-free battery for easy starting and additional accessory power. A dedicated accessory fuse is located under the seat. The new, stacked, 65/55W halogen headlamps illuminate the road when your ride stretches into night. The LED tail and brake light is bright and vibration resistant. The turn signals use bright amber incandescent bulbs with clear lenses. A handy 12V DC accessory outlet is mounted on the inner dash (was an option on prior model). Using SV650 engineering, the V-Strom’s DOHC, liquid-cooled engine has new camshafts to deliver clean, strong power at any RPM. Low-friction resin-coated pistons and SCEM-coated cylinders help delivers high mileage for class-leading touring range. The sleek two-into-one exhaust system routes below the chassis to reduce weight, centralize mass, and provide space for a narrow tail section (and optional luggage). The exhaust system has twin catalyzers and employs O2 feedback to the EFI system to produce optimum combustion efficiency and reduce emissions to an incredibly low level. The fuel injection system employs Suzuki’s innovative, SDTV (Suzuki Dual Throttle Valve) on new 39 mm throttle bodies. The secondary throttle valves are controlled by a servo motor for smooth power delivery. Ten-hole; long-nose type fuel injectors on each throttle body improves fuel atomization for better combustion efficiency and while reducing fuel consumption. Suzuki’s patented, Throttle-body Integrated Idle Speed Control (TI-ISC) stabilizes the engine idle speed and helps lower emissions. The system is compact and lightweight. 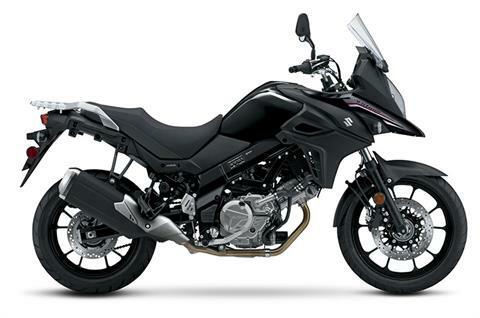 The TI-ISC on the V-Strom 650 ABS has Suzuki’s Low RPM Assist feature that seamlessly adjusts engine speed during take-off and low-speed riding to smooth the power delivery and to help reduce the possibility of the rider stalling the motorcycle. The Engine Control Module (ECM) provides state-of-the-art engine management and has enhanced settings to suit the intake and exhaust systems, resulting in better fuel economy and linear throttle response. The engine has dual spark technology heads with two, high-energy, slim electrode spark plugs per cylinder, aid in combustion efficiency and power production. The V-Strom 650 is equipped with Suzuki’s advanced Traction Control System* which lets the rider control the throttle with more confidence in various riding conditions. It continuously monitors front and rear wheel speeds, throttle opening, engine speed, and the selected transmission gear to adjust engine output if wheel spin is detected. There are three traction control modes (1, 2, and OFF) and the difference between the modes are their sensitivity to road conditions. Mode 1 is lowest sensitivity level most suitable for skilled riders or in conditions that have good road surface grip (riding on good, smooth roads). Mode 2 is highest sensitivity level suitable for road conditions where the grip may be limited (wet or cold surfaces). OFF disengages all traction control features. The V-Strom also features the Suzuki Easy Start system which lets the rider start the motorcycle with a momentary press of the start switch without pulling in the clutch lever when the transmission is in neutral. The compact radiator is flanked by new-style, wind directing plates that enhance cooling efficiency and direct heat out of the side vents away from the rider’s legs. The 6-speed transmission suits sporty rides with tight 1st through 5th gear ratios and a tall top gear (6th gear) for highway cruising. Low-maintenance, long-life sealed O-ring drive chain is standard. Liquid-cooled 645cc, 90O V-Twin engine delivers strong torque in the low to mid-RPM range, yet provides a strong rush of high RPM power that’s ideal for any riding mission. Suzuki’s rider-adjustable Traction Control* system, Easy Start system, Low RPM Assist feature, plus ABS** technology makes a great motorcycle, really incredible. Multi-function, illumination adjustable Instrument Panel brings a wealth of information to the rider in a concise manner and helps with setting rider-assist features. Effective fairing, with vertically stacked headlights, adjustable windshield, and iconic Suzuki DR-Big styling adds true adventure style and real-world function. Strong and light chassis has integrated mount points for unified Suzuki V-Strom luggage that’s is easy to clip on and off, and keeps the motorcycle trim when ready for touring. 12-month limited warranty. Coverage period and additional benefits available through Suzuki Extended Protection. Price, if shown does not include tax, license, electronic filing fees, tire fees, dealer documentation fee, any applicable freight and/or added dealer mark-up (A.D.M.) 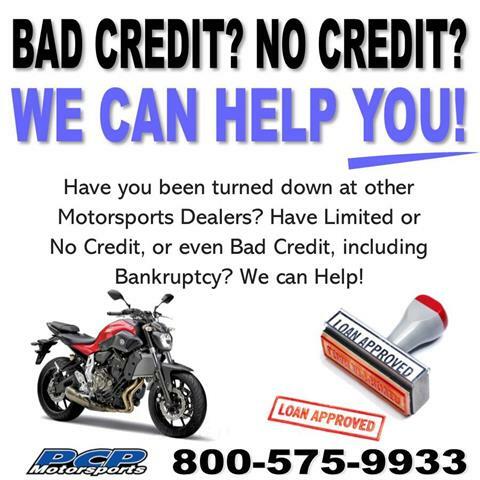 or any finance charges (if applicable). Final actual sales price will vary depending on options and/or accessories selected. NOTE: Models with a price of "Request a Quote" are always included in a $0 search, regardless of actual value. 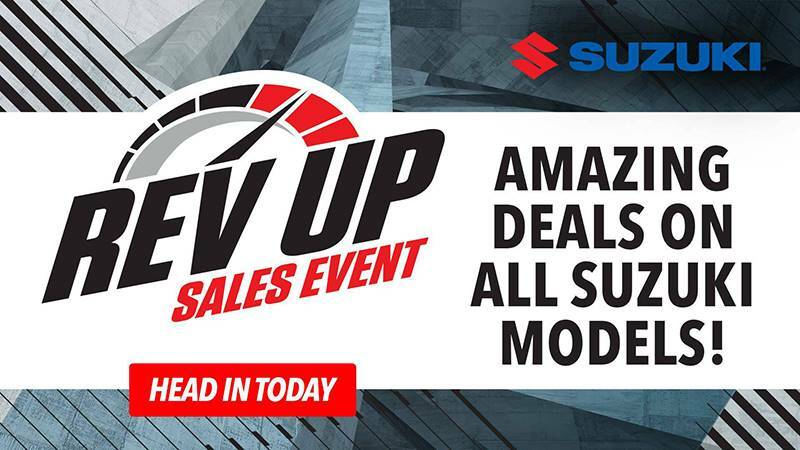 All dealer incentives/rebates, customer incentives/rebates including free warranty/winch credits and/or free accessory packages have all been applied to the sale price. All sale prices are cash only prices. The sale price may not be valid if the customer chooses to use a promotional finance rate or offer such as but not limited to Suzuki low APR financing, Kawasaki Westlake high risk financing, free warranty, winch and/or accessory offer in lieu of rebates offered on the vehicle by the manufacturer. Discount offers cannot be combined. See dealer for full details. A reconditioning fee may be charged on a pre-owned vehicle.